At present, the world is witnessing the huge increase in the mobile market and it is growing at a rapid speed. The estimation and prediction done for the mobile world are about 4.5 billion worldwide use the mobile internet and the number of mobile phones will exceed beyond the world’s population. This is the reason why most of the business is trying to dive deep in the mobile app development and are finding ways to earn a niche. And no doubts in the thoughts that there are the ways the entrepreneurs are finding to learn and earn. So if you are also at the same stage for mobile app development, looking to develop applications whether iOS or Android one, you need to pay the special attention for its usability. How much time do people work or surf on mobile phones? Do you have any idea? Any approximations? These approximations are pointed out via some of the recent studies. It says that the US users spend their 86 percent of the time on their mobile phones exclusively on apps. And from that, the mobile users spend about 80 percent of their time using only five applications from 24 mobile apps on daily use. See, how you can rise your business via mobile app development. People demands for the work on the mobile itself. Remember, the rise of your business is possible only when every step of the mobile app development is clear with the expertise without any bug or confusion. Forbes has estimated that with the coming next year, the mobile phone users will download about 270 billions of mobile apps. Now the matter is to rank your apps in that top five apps user use on a daily basis. For that, the mobile app usability testing is as important as brushing your teeth every morning. The usability of Android or iOS application is important as the users will uninstall your apps if they don’t find it useful or comfortable or convenient. What is the user’s action? They find their task more important so they’ll find a way another similar app from the Play Store or App Store. What is the Usability of the mobile app? 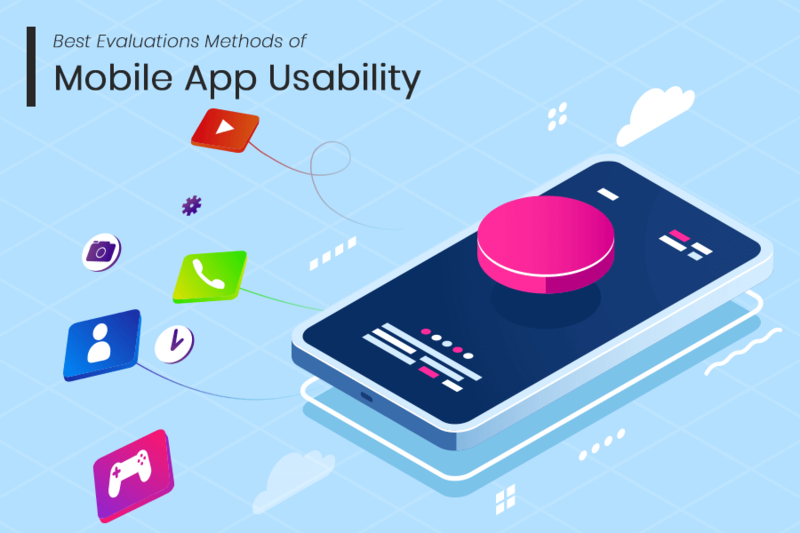 Generally, the users perceive popular mobile apps in regards to the ease of use, convenient and less time consuming to complete the important and purposeful tasks. Besides the importance of easy usage of the mobile apps, the usability principal does not agree on the list from the manual conclusion. Accordingly, the best way to evaluate usability is mobile app usability testing. Before testing the mobile app’s usability, what important aspect is the test plan. You will need to develop the test plan for the mobile app usability testing. Now, the concerns are what does this testing include in itself? Let’s have a look. Usability assessment testing methods differ for different mobile app development teams and companies. Everything in the world, before starting needs to set a goal. So, it can achieve that goal without distractions. This same goes with usability testing also. So, what theory you want to set goals to achieve that goal? What queries you want to solve to provide answers? Now the key question comes. How will you set these goals? Moreover, it is suggested that ask a few questions to the interested parties of the mobile applications including the developers. Depending on the received answers, you will know the two most important things. Based on the answers received, it would be easy for you to start defining the goals and usability indicators. It is a must that the defined goals are specific, measurable, and prioritized. It should occur in a sequence for the smooth flow of the test session. For any form of testing, it is important to execute the dry usability test so that you can be sure that the task execution ultimately makes out to the goal. Mobile app usability testing is user-oriented. Moreover, this means that real users perform realistic tasks to the mobile application which is more resource intensive. This can give more accurate results. I suggest you recruit the test participants who can use their device for at least 3 months. This will overcome the problem and clear it out that the problem exists in a mobile device and not in the application. Additionally, if you use your own test participants’ devices, it will reveal more problems as they will be using real devices rather than top-level devices and fast internet connections which are mostly available in a development environment. Be careful in recruiting the test participants. What you need to remember is your test participants should match the targeted audience of the application. Hire dedicated developers for your mobile app development. There are about two main methods for your mobile app usability testing. What we discussed above is totally laboratory usability testing method. It gives the facility to test mobile applications with real users and real devices. Such a study gives accurate results and draws you towards the right conclusion. Laboratory usability testing is conducted to observe the test participants who perform tasks with mobile applications. A camera – to monitor the movement of the test. So, now that you know about the real user testing method – Laboratory usability testing method, start with it today to get your mobile app development at the peak of the success. If not today, still it is important to note for the future mobile app development process. Add the mobile app usability testing methods to the stages of your app development process. Newer How Progressive Web Apps will Substitute Native Mobile Apps? Older How Social Media Apps Influenced With Augmented Reality?